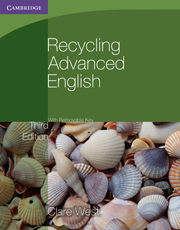 A series of four books that provide extensive guidance and English practice in key areas of the language. 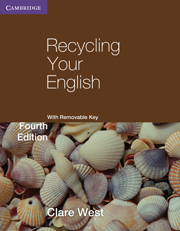 Recycling Your English (fourth edition) provides extensive guidance and practice in five key areas of language: Grammar; Phrasal verbs; Vocabulary; Word study and Writing. This popular book has been revised throughout to take account of recent revisions to the FCE syllabus, and has been expanded to include a new Writing unit on Reviews. 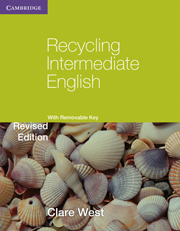 It can be used to supplement any coursebook at upper-intermediate level, in class or for self-study, and is suitable for students preparing for the Cambridge FCE or IGCSE in English as a Second Language examinations. 77 user-friendly units and eight tests. Wide variety of challenging exercises. 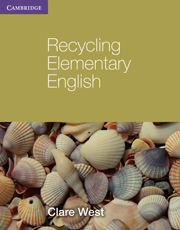 Regular recycling of grammar and vocabulary. Model compositions for writing tasks. Practice in all task types for FCSE Papers 2 and 3. Recommended by University of Cambridge International Examinations for Cambridge IGCSE English as a Second Language preparation. Ideal material for classroom use of self-study.